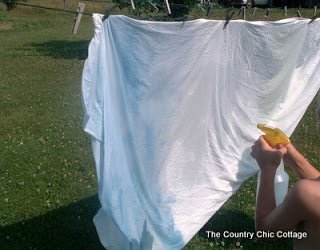 My summer fun projects with the kids continues! This week’s crafts for kids comes from Family Fun Magazine with thier Outdoor Spray Painting. 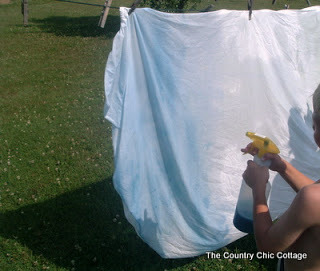 Hang a sheet over the line, grab a spray bottle and some paint and get started! We had fun mixing different colors and seeing what would happen! Get out and have some fun with your kids this summer! This looks like fun! I have to grab a white sheet next time I run to the thrift shop! So fun! My wee one would go crazy with this project. Great idea! Little ones would love this. Thanks for sharing at Beach Cottage Good Life Wednesdays.